Let me take you back to Thursday, 29th May 2014 and the next part of my Nova Scotia adventure. I was super excited about this part of the trip because, having done some research online, I knew that Alain Bosse, The Kilted Chef, was Canadian celebrity chef , president of Alain Bosse Consulting Ltd, food editor for Saltscapes Magazine, past president of Taste of Nova Scotia and ambassador of all things culinary in Atlantic Canada. 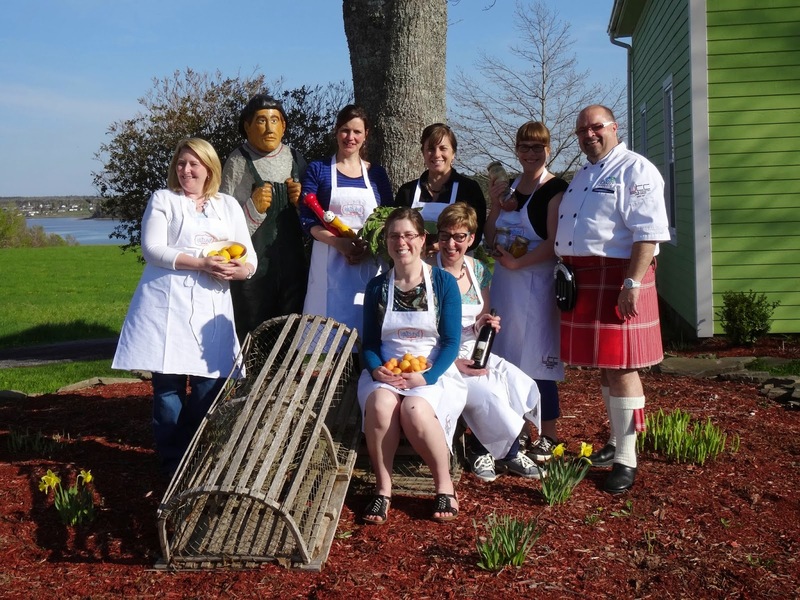 The Kilted Chef offers a culinary journey from the pasture, to the sea to your plate. Cooking on the Farm is a full-day, hands-on culinary experience you will never forget and this is what I was to experience. I was delighted to be joined on my culinary journey by some of the staff from Nova Scotia Media, who were quite delightful and by the end of the day I felt like I had known them for years! We started with a short tour of the farm with Alain telling us about how he came to buy it and what plans he has for the future. The we headed out for our first stop at The Pork Shop, The Pork Shop prides itself in using only the freshest products available on the market. All spices are 100% pure and contain no MSG, gluten or any other type of filler in them. All of the meat products are gluten free with no filler or by products, and are smoked with maple wood chips with no liquid smoke used in any product. The smoked ham and pork loins are phosphate free; they are soaked in brine for flavour. We were able to see the products being smoked, in fact we all got a bit smoked when Alain opened the smoker! 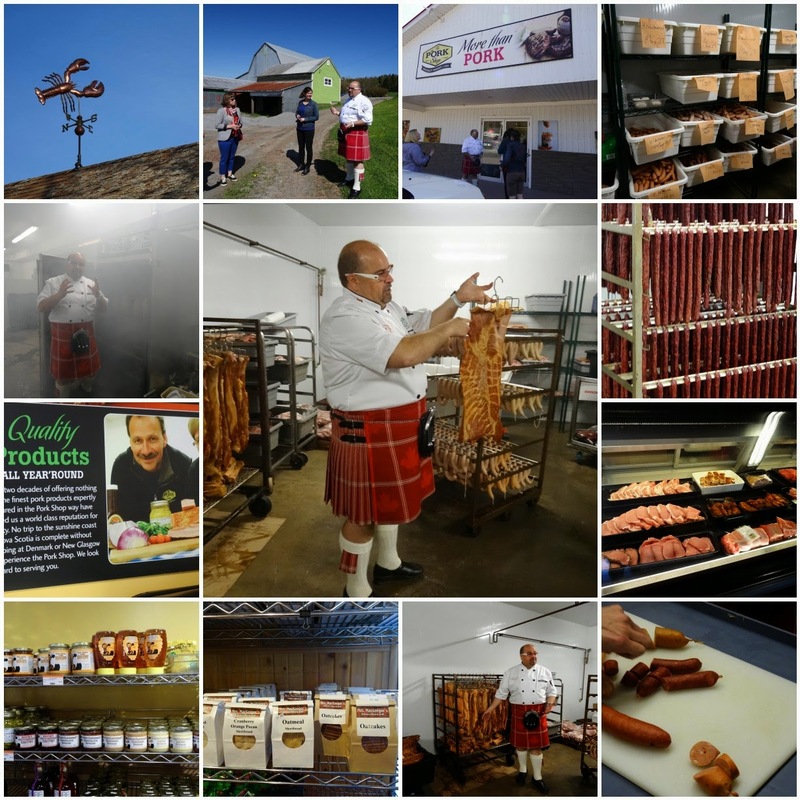 There are a huge variety of pork products made at The Pork Shop and they are renowned for their bacon and sausages, we were able to taste a variety of sausages including the spicy pepperettes that you can see in the photo hanging on the stand. Alain picked up some products for us to use in our cooking later in the day. We then headed to Harold Ferguson's Abattoir. As a farmer with a grandfather who was an old fashioned butcher, the abattoir was not something which phased me, in fact it was a pleasure to visit a place which operated on a small scale with far less stress on the cattle than in a huge modern abattoir. The abattoir is staffed by retired butchers and also rehabilitates ex offenders and they are all proud of their skill and the excellent meat they provide. 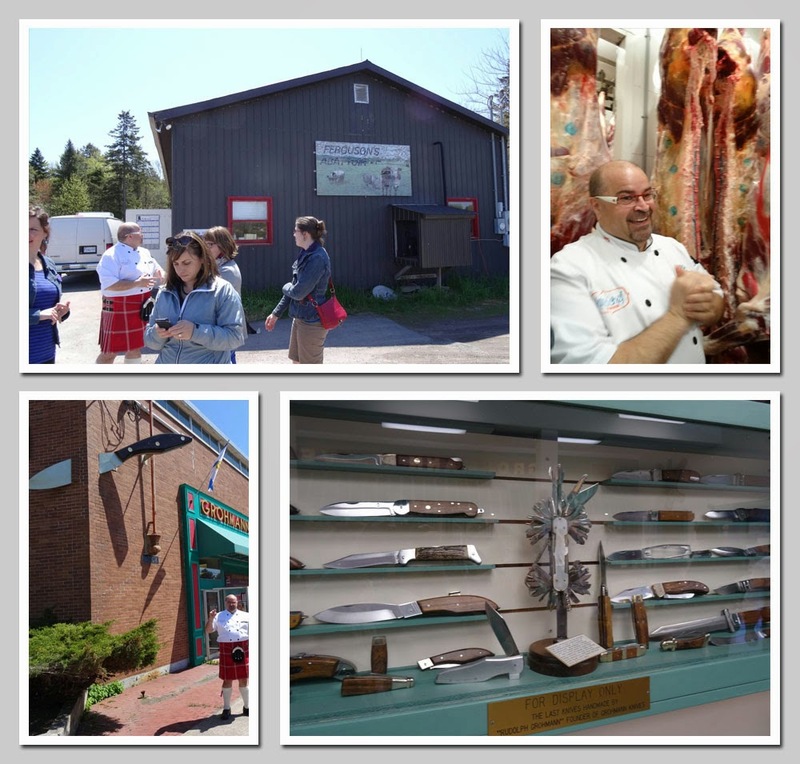 A quick trip into Pictou to Grohmann's Knives the knife supplier favoured by the Kilted Chef and as we all got a set of Grohmann's knives to keep as part of our day cooking on the farm, I can attest that they are extremely good knives. 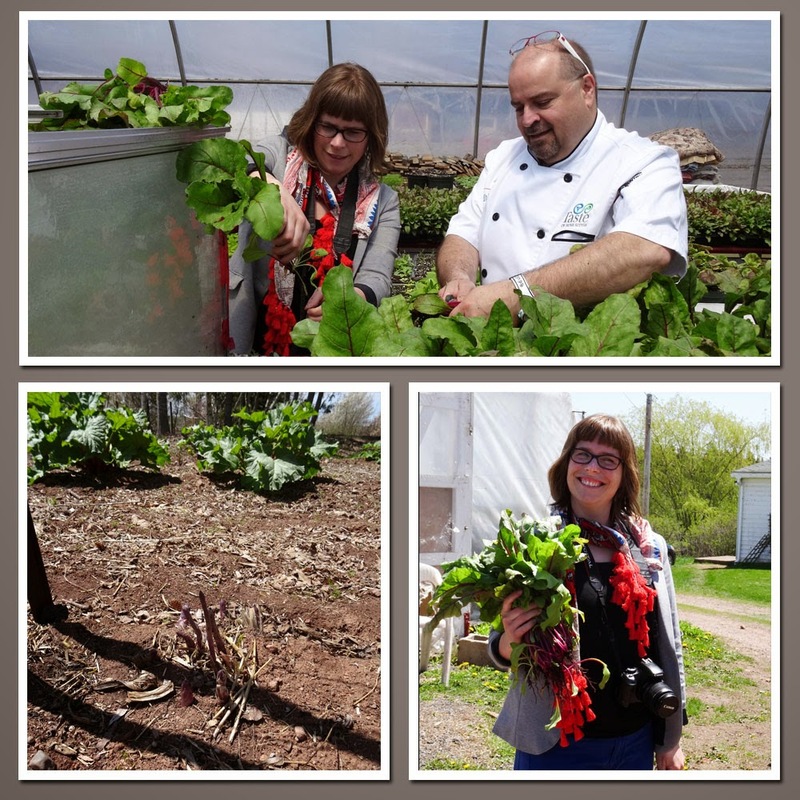 It was early in the season for fresh produce at Lakenman's Farm, spring had come late to Nova Scotia the asparagus had just finished and there were only a few vegetables coming through in the polytunnel. We did find plenty of beet tops and Sarah was presented with the 'bouquet' of beets! Then we were off to check out the lobsters at North Nova Scotia Seafood. North Nova Seafoods Limited is a fish-processing plant locally owned and operated by Paul Logan. The Logan family has been involved in fishing and fish processing since the 1800s. Logan & Roberts were operating a factory and buying station on this same shore by 1903. Russell Logan, Paul’s father, bought and shipped fish until 1962.In 1987, Paul started North Nova Seafoods which buys and processes seafood including Lobster, Herring, Rock Crab, Mackerel and Snow Crab throughout the year. North Nova Seafoods has it own wharf and buys Lobster from its own fleet, as well as from fishermen of other regions. This Lobster is either processed at North Nova or sold live to companies and processing plants in Nova Scotia, the United States and Europe. As well, 125-150 fishermen from wharves at Cape John, Skinner’s Cove, Pictou Island East and West, Sinclair’s Island, Lismore and Cheticamp supply the plant with Herring, Mackerel, Lobster and Rock Crab. Situated in Pictou County, Nova Scotia, Canada, adjacent to the rich fishing grounds of the Northumberland Strait, North Nova Seafoods employs more than 100 people. 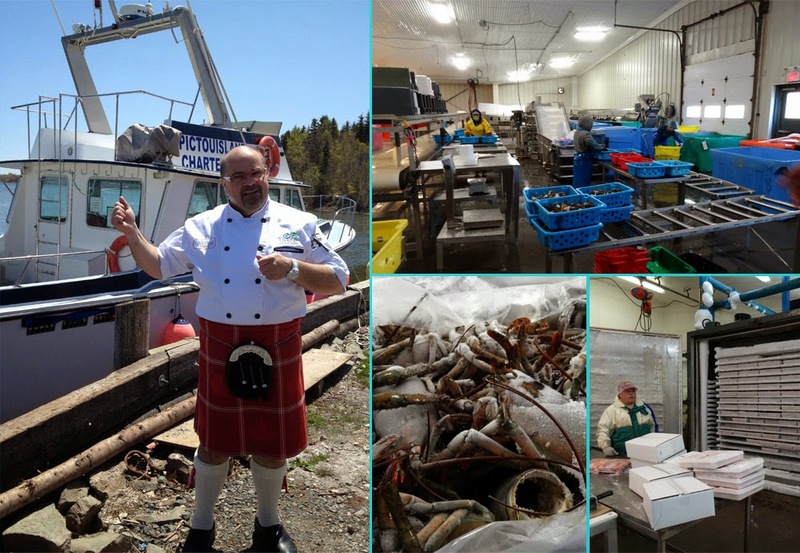 I will leave you with a little bit of lobster chat from The Kilted Chef himself, in the next Nova Scotia post we will take all the ingredients we have gathered and cook them into a delicious meal, I hope you will join me. Ahhhh more brilliant memories of such an incredible trip. Great write up. So much good quality food.